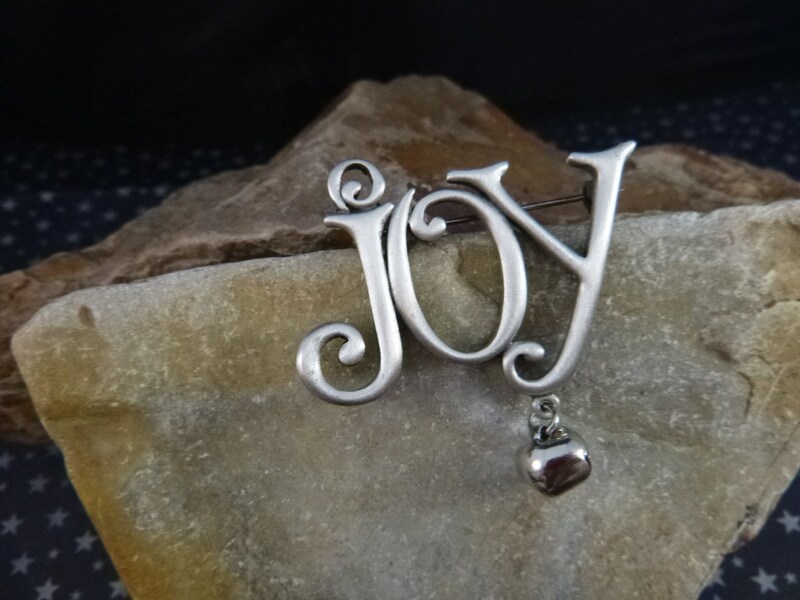 While the Christmas message of “Joy to the World” is celebrated with this vintage pewter brooch, its timeless message can apply to other holiday celebrations. This simple holiday pin is from the mid to late l980s. It’s signed with the maker’s mark © JJ slanted. That copyright designation of the Jonette Jewelry company was used in the 1980s. This festive and joyful holiday brooch with its dangling bell is in very good condition, with light signs of wear. 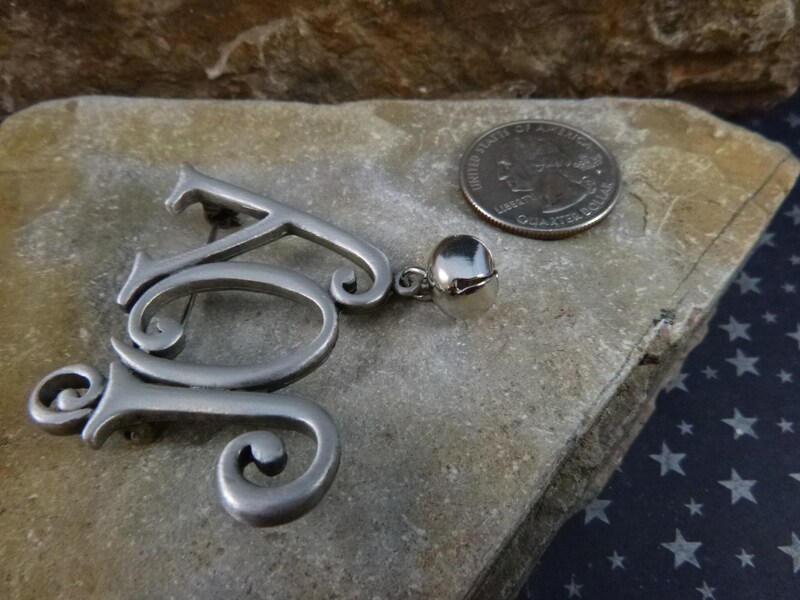 It’s made of pewter and has a quality feel to it with a secure clasp and pin. Measuring 2” long and 1.75” from the top of the letters to the bottom of the bell. 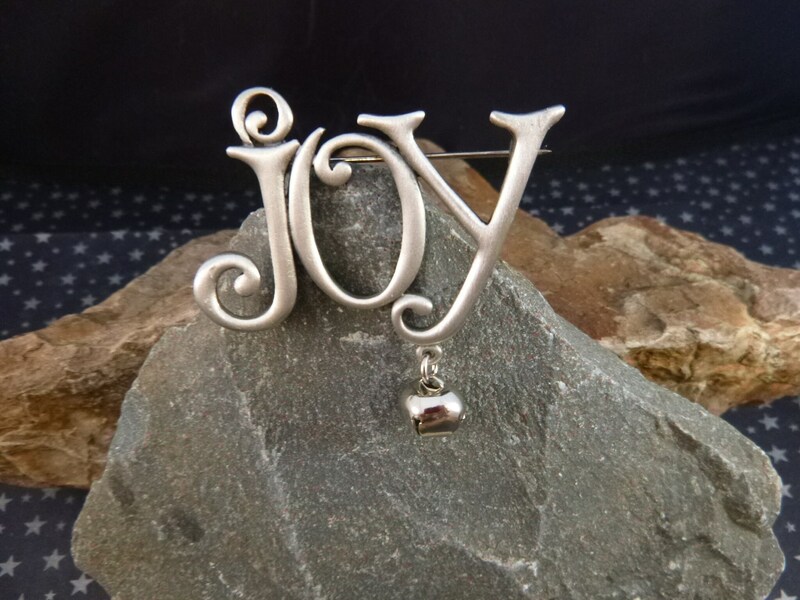 It a wonderful jewelry addition for any Christmas or holiday lover. 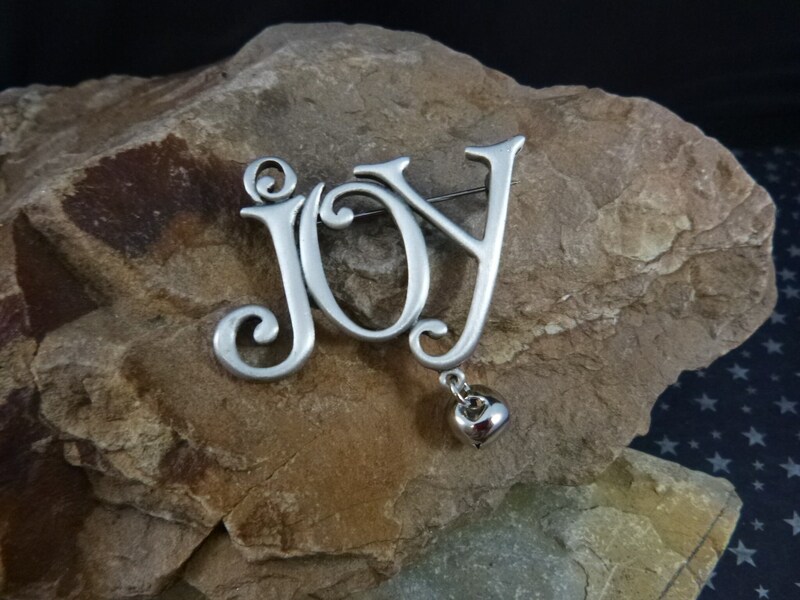 The photos offer additional perspective on this joy message pin. (Note: I have a red camera and on some pictures there’s a slight reddish shadow, not discoloration to the metal). If you need something quickly or shipped internationally, contact me. 1. Collection of Personal Information – To fulfill your order, there is information that is needed, and that you authorized Etsy to provide to my shop. This includes information such as your name, email address, shipping address, payment amount, and product selection. You might also provide information related to the sending of a gift, or if you contact me directly with questions or a special request. a. As needed to provide services of my shop to fulfill your order, settle disputes, provide customer support, or improve shop services. b. As needed to comply with a legal obligation, court order, or in connection with a legal claim, such as retaining information about your purchases if required by tax law. c.	If you sign up for my mailing list or other product alert information, which you can revoke at any time. a. Use of third party services such as delivery companies, only to the extent necessary to perform such service or resolve claims or track delivery. b. Business transfers for selling or merging my shop with another business only to the extent permitted by law. c.	Compliance with law to collect, use, retain, and share your information if that is reasonably necessary, in good faith believed to be needed to respond to legal processes or government requests, or agreement enforcement. 4. Length of Time – Personal information is not stored beyond the period of time necessary to meet this shop’s business purposes to comply with legal or tax obligations, or your request for notifications. Typically that is 5 years. 5. Transfer of Personal Information Outside the EU – Etsy provides me, as an Etsy Shop Owner, with the information needed to process your order. I do not use any other service to transfer, receive, or store your personal information. Some pieces I clean, others I don’t. However, the majority of items are presented as found. There are a variety of collectors and collectible pieces, and an equal number of opinions about whether a particular vintage item should or shouldn’t be cleaned or repaired. I err on the side of being conservative here, wanting you to decide how to treat your item. There’s plenty of information available online that will help you determine the best way to clean, preserve, or treat any vintage item. 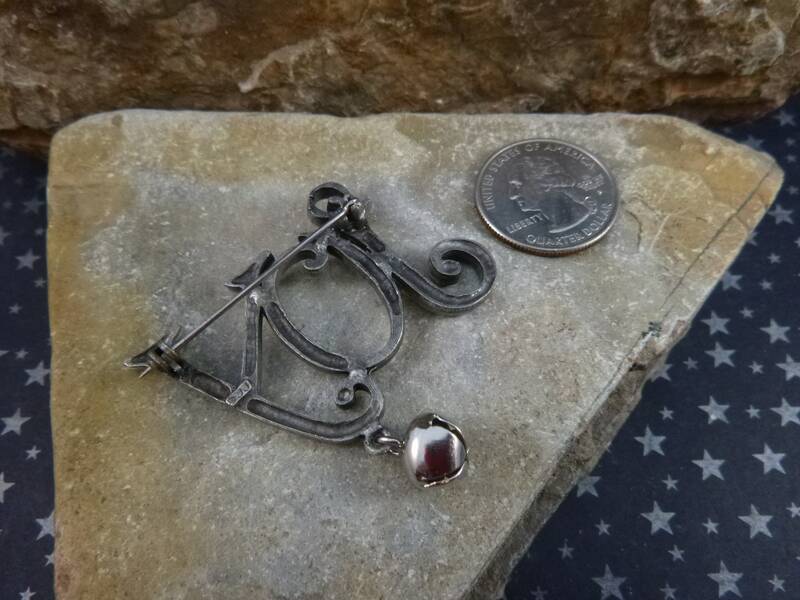 All vintage jewelry items arrive in a gift box.